Eusebio di Francesco accepts that he needs to make some changes to his struggling Roma side for Wednesday's match against Frosinone. Roma lost 2-0 against Bologna at the weekend and have only picked up five points from their opening five matches of the Serie A campaign. They are already 10 points behind Juventus who made it five victories out of five so far this term by beating Frosinone 2-0. 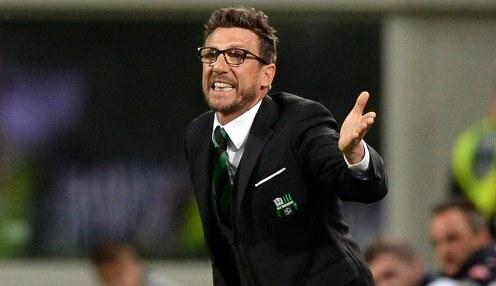 Di Francesco said: "Unfortunately, the answers that I did not get will lead me to make changes. "We will see with a cool head. This team gives the feeling of having little defensive solidity." After playing Frosinone, Roma play Lazio in a crunch derby clash on Saturday. Elsewhere in Italy over the weekend, Napoli are second after recording an impressive 3-0 victory over Torino. Carlo Ancelotti's side are 1/5000 to finish in the top four this season. AC Milan had to settle for a 2-2 draw against Atalanta when Emiliano Rigoni scored a late equaliser for the visitors. Disappointed Rossoneri coach Gennaro Gattuso said afterwards: "There is great regret, we are a two-faced team. We played a great first half but in the last half-hour we struggled and we suffered against our opponents. "It has been happening for four games now. Sometimes we play good football, but that's not enough, we have to do more. "We have to improve because if you do not close the games it is normal that they can then become a problem. This is the aspect to be improved." AC Milan are 1/1 to finish in the top half.